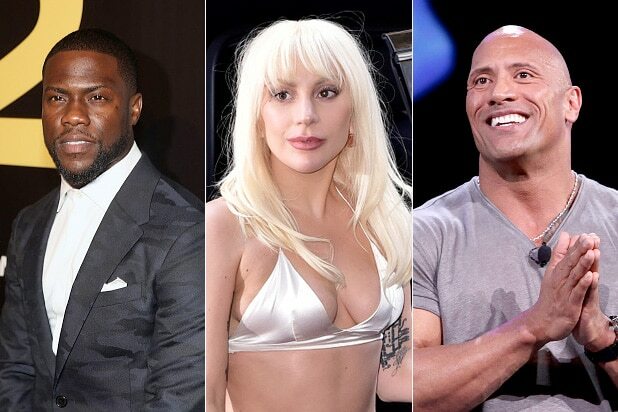 Lady Gaga, Kevin Hart, Dwayne Johnson and Jennifer Lopez are among the second round of presenters revealed for Sunday’s Golden Globe Awards, the Hollywood Foreign Press Association announced on Thursday. Other presenters include Mark Wahlberg, Viola Davis, Michael Keaton, Morgan Freeman, Eva Longoria, Terrence Howard, Taraji P. Henson, Melissa Benoist, Jason Statham, Ken Jeong, Grant Gustin and Maggie Gyllenhaal. Davis and Henson are each up for Best Performance by an Actress in a Television Series – Drama, while Gaga has been nominated for Best Performance by an Actress in a Limited Series or a Motion Picture Made for Television. The latest Golden Globes presenters join Amy Adams, Jaimie Alexander, Patricia Arquette, Jim Carrey, Jamie Foxx, Mel Gibson, Amber Heard, Bryce Dallas Howard, Kate Hudson, Jennifer Lawrence, Helen Mirren, Julianne Moore, Eddie Redmayne, Amy Schumer, J.K. Simmons, Channing Tatum and Olivia Wilde, who were announced on Tuesday. The 73rd Golden Globe Awards, hosted for the fourth time by comedian Ricky Gervais, will air Sunday at 8 p.m. ET on NBC.